TWO ESSENTIAL MUSIC TOOLS ON YOUR HEADSTOCK Compact and simple to operate, the TU-03 puts two ess.. COMPACT AND EASY-TO-USE CLIP-ON Ideal for guitar, bass, and ukulele, the clip-on TU-01 is the mos..
Boss TU-30 Chromatic Tuner / Metronome THE ESSENTIAL PRACTICE COMPANION For years, the TU-80 T..
Korg CA-1 Chromatic Tuner High-precision LCD needle-type meter for stable tuning Wide range ..
Korg CM-200 Contact Microphone Directly capture the sound of your instrument in style! A pie..
Korg GA-1 Guitar Tuner Ultra-compact LCD needle-style dedicated Guitar and Bass Tuner High-p..
Korg Pitchclip Compact, accurate, and easy to use, Pitchclip is the discreet, chromatic clip-on t..
Korg PitchCrow Dedicated guitar/bass modes In addition to the conventional chromatic mode, the..
Korg Sledgehammer Pro Unique, high-visibility 3D visual meter display Ultra-precise clip-on tu..
Korg TM-50 Combo Tuner - Metronome Use the tuner and metronome simultaneously! 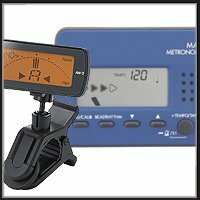 The TM-50 – ..
Korg TMR-50 Combo Tuner - Metronome - Recorder All in One Unit! The TMR-50 - Your Ideal Practice ..